Have you tried stress relief toys like fidget spinners and ADHD gadgets before? If so, you know that there is something off with you. No matter what you do, you just can’t stay focused – it happens to everyone. But, when this lack of focus starts cutting into your productivity, it gets a lot worse. Anxiety levels soar. Nervousness levels soar. Fear of losing your job or not being able to meet your work demands start to amplify, too. It’s okay to get distracted for a few moments, but when these moments turn into days, weeks or even months, you need to make a positive change. The Comfort Cube can help. What is A Comfort Cube? Comfort Cube is revolutionary, and it’s a small gadget that’s a great gift for friends, family or yourself. Small and compact, you can carry this neat little cube with you wherever you go, and it will help you overcome those focusless days that are plaguing your life. Addicting, fun and essential if you want to reach peak focus, these cubes are meant for the person with the fidgety hands or the person that knows that they have the attention of a dog when a squirrel runs past them. You’ll find that this small cube helps you realign that focus, kill wasted time and relieve the stress you’re feeling from being unproductive day after day. This is the anti stress cubes psychologists love to keep on their desks. What Are Anti Stress Cubes? Anti stress cubes are an innovative way to help your mind focus. You know those times when you know you can be more productive but can’t seem to get your act together? We all have them, but they quickly start to eat into our days and weeks not allowing us to reach out full potential. Six-sided, this cube has been scientifically designed to help you reduce stress and improve cognitive performance through six main tools. Click: The click side has buttons that allow you to “click” with your fingers. Flip: There’s a neat flip switch that you can switch back and forth. Roll: This side of the cube has three mechanical gears and a ball in the middle that allow you to roll your fingers. Breathe: The breathe side has a design meant to mimic that of stress stones that can ease anxiety and reduce stress. Glide: The glide brings out a person’s inner gamer allowing them to glide their thumb or other finger in a 360-degree motion. Spin: A rotating dial is on the final side of the cube allowing you to spin the dial. The world is a stressful place, and when people need to cope with stress, they often run towards things that are bad for them – stimulants, for example. 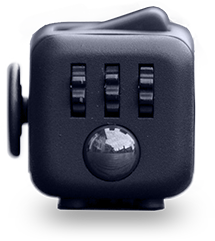 This cube allows you to target all of the fidgeting movements that come to you throughout the day without needing to pick up a cigarette or have that extra glass of rum. Relax – you can’t be stressed when you’re relaxing. The idea is that this cube will allow you to fidget all you want without needing to even get out of your desk chair. You can relax and relieve some of that stress and nervous energy with the help of the Comfort Cube. Focus – set your sights on the main prize and focus. When you allow your mind to wander and your hands to fidget, you’re allowing your mind to recenter and go to being productive and focused. This enhanced concentration will start to go towards your work, hobbies and anything you’re struggling to focus on. Your mind needs a break from the things you’re forced to do: work, clean, study – everything that makes a productive life. The good news is by letting your mind wander, you’re able to unlock your creative side and learn to focus even more. The great Albert Einstein worked in a patent office, and while this is no small feat, it allowed him to write several scientific papers and make groundbreaking breakthroughs that still mystify the world of science today. Einstein wasn’t working at a University – he let his creative mind wander at the patent office. He eventually taught around the world, but he made most of his biggest contributions to the world during his time at the patent office. It shows that even the world’s smartest people need to let their mind wonder. Comfort Cube allows you to relax, unwind and unlock that focus that’s needed to have a day filled with productivity and creativity. If you keep your mind locked away and never allow yourself to fidget, you’re constraining your mind. Comfort Cube breaks through these barriers allowing you to be the best you possible. Great little tool that helps me focus when reading or during a busy meeting. I don’t bite my nails or shake my feet like before. My anxiety is gone. I use my Comfort Cube everywhere I go from work to home and even at school. You’ll find this product reviewed across the Internet’s most trusted publications, too. There’s one thing for sure: people love the Comfort Cube. When you have anxiety, bite your nails, shake your foot or have to find some way to let your mind wander, the Comfort Cube can help. This is a revolutionary idea that helps you unlock your true potential and allows you to finally focus. Where Can I Buy Comfort Cube? Comfort Cube was a KickStarter project that has literally exploded. If you see this product on eBay or Amazon, you can be confident that you’ve come across a knock-off. There’s a lot of people selling knock-offs that either don’t work at all or are not as good as the original. And you need to buy Comfort Cube from the manufacturer if you plan on getting the real deal. This is the best investment you can make right this minute to boost your focus and creativity. It’s like unlocking your focus from the jail that is stress and anxiety. You can reach a higher potential, and it all starts with a little focus and concentration. 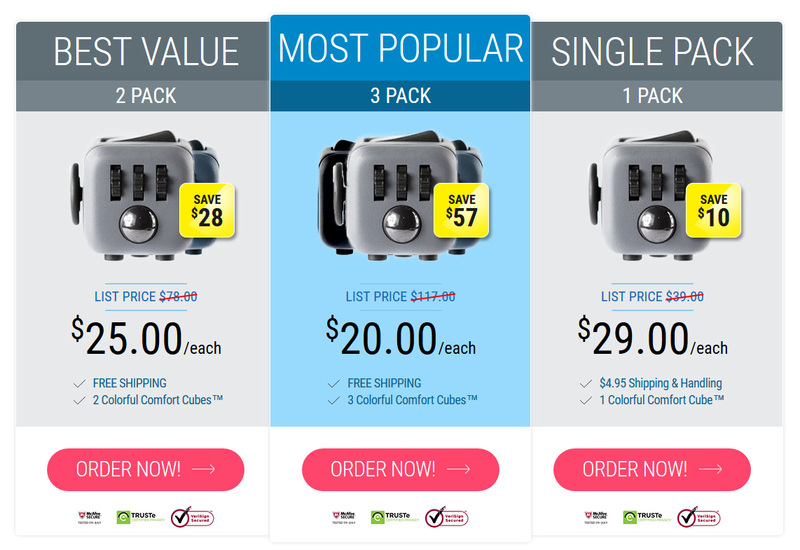 Click here to order your Comfort Cube today! Previous PostCan OptiMind Improve Your Mental Performance?